It was a typical afternoon. I stopped to pick up my fellas from their school, the car door opened. Getting in our vehicle, my usually fun-loving, mild-mannered tween clearly was in a mood. “I’m glad to see you,” I said while waiting for my fellas to buckle up. “I don’t see what is so good about it,” my tween mumbled under his breath while slumping into his seat. While riding home in silence, it was clear my fella didn’t want to talk. I wish his tween moodiness stopped in the car, but it was just the beginning of a really rough afternoon of eye-rolling, sarcasm, and just an overall bad attitude. Looking at him, I knew. We have officially entered the hormonal tween stage. Has your kind, helpful kid suddenly started having outbursts of frustration, resorted to talking back, or even yelling at you? Sure, you hear your tween mumble in his breath, and you see them throw their things down as they walk away. At that moment, you might be in shock your sweet fella has gone from mellow to mean in the blink of an eye. Don’t worry momma; it’s not you. With adolescence tagging along with your tween, your child naturally becomes torn between wanting to be near you and wanting to know who they are without you. They crave independence. Unfortunately for parents of male tweens, boys tend to fluctuate between withdrawing and defiance as a way to exert their independence. Their behavior is not about you momma! Nope. Their behavior is simply your fella’s way of teetering between the world of being a boy and becoming a young man. In those moments when your teen’s attitude begins to flare, be careful with your approach and words. As moms, we can posture ourselves to show we are the authority. But in those moments of wanting to show our authority to our sons, we can sow seeds of discourse. God has already placed everything in them to become mighty men of God. As moms, we have the privilege of nurturing the gifts, talents, and personality God uniquely put into each of our sons. We are not at war with our sons. We are one of their greatest allies, so we need to act like it. We need to keep our cool. Being a mom four sons, I have made plenty of mistakes walking out this mom journey. Learning how to handle correction and praise, so my fellas don’t shut down and pull away is an ongoing part of my growth as a parent. When our tweens start to act out, I would like to say I praised them louder than I corrected them, I didn’t. I fussed. Fussing never wins over anyone, and nothing ever changes. Thank God for His grace and mercy. When we decide as parents we want to make a change in how we lead our children; God will meet us right away. Instead of being loud, fussing about all the ways your tween has been challenging to be around and won’t stop lying, praise the good and small improvements. Look for ways to speak positively to your tween. Then when correction is needed, speak softly. No fussing. No nagging. Make an effort to have corrective conversations separately (even away from siblings) and in private. Your goal is to correct the behavior not embarrass your tween for messing up. Your child has just accused you of “never listening,” “not caring about what he wants,” or/and “being mean.” If you are anything like me, there are moments I want to react. When your preteen starts with the aggression or irrational outbursts of emotion, take a moment to pause. Their outburst should not create an outburst of reckless words on your part. As much as you want to defend yourself or put your kid in check, pause. Take a breath. Maybe even walk away from the conversation. As a matter of fact, encourage your child to take the same steps to help diffuse an already emotionally charged situation. Remember, we want to help guide our children not shame or criticize them for feeling big emotions. When our tweens are responding in inappropriate, maybe even disrespectful ways, we need to address the behavior, but you cannot do this if you are losing your cool. God anointed me and equipped me to nurture and love my child. My child is not my enemy. I am not the enemy of my child. My son is a child, responding and reacting like a child who needs love and direction. God has given me authority over my child. I don’t have to prove what I already have. Your child’s growing attitude is not a reflection of you or how you are parenting your child. As the surge of hormones kicks in and outside influences start to become important, your tween is going to think and feel things that might be contradictory to what you have taught. Don’t freak out! Choosing to take our tween’s actions personal removes responsibility from the child and can cause you to become insecure, bitter, and make poor decisions. You are not in control of your child’s actions, feelings or behaviors. Even with teaching them proper ways to respond, our children are still going to make mistakes and act out. Sometimes their hormones are just out of control. Even your tween won’t fully understand why he is angry or why he doesn’t want to be around people. Newsflash, your tweens negative behavior usually has NOTHING to do with you. Don’t own their emotions, guide them through instead. As always momma, we want to remind our children they are loved, valued, and seen. We want our children to know their bad decisions do not define who they are. Sometimes our kids need to be reminded God uniquely created them with incredible gifts. If we, as parents, can keep our cool then we can look for ways to help our children see their strengths through their negative behavior. We can take a negative moment and turn it around to be a teachable moment. 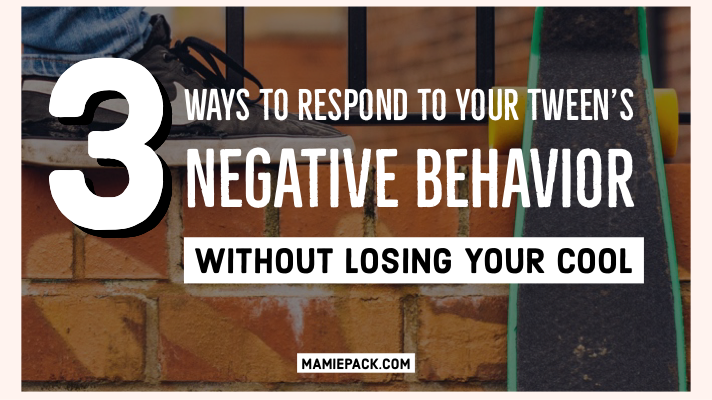 Loving these tips on how to respond to your tweens negative behavior. I especially love the praise loudly, correct softly. Great post! This is very helpful- I need these suggestions for my 10 yr old twins! My kids are still young but this is a great article and have tips that I can put into practice even before they become tweens. Absolutely Kristal! All of the strategies can work for children of all ages. We talk a lot about the hormonal changes girls go through that we don’t talk enough about what boys go through. Yes! Sometimes it is hard to not take it personal because it feels that way. Ugh! Great information my daughter just turned 11-years-old yesterday and I declare the last few months I’ve wondered where my little submissive child disappeared to. The rolling of the eyes and huffing and puffing when she is told to do something a little crazy. So you post is perfect counsel, thank you! Yes! Those hormones are no joke. We have to help each other out. These are great tips for managing teen and tween behavior. It can be so hard not to lose your cool when they’re acting bratty. Yes. With those hormones you never know when that is going to happen. So beautifully written! My daughter is the tween right now, but my oldest son isn’t far behind. I’m so glad this came to me today, because these are words I needed! It is such a difference when girls hit this stage versus boys. Oh the eye rolling! Thank you for these tips! Oh, momma!! Sounds like you have a future world changer! What I appreciate about this post is that it can be applied to a younger child as well. My daughter is 3 and the level of rational actions is minimal. To make sure I reinforce the better behavior I have to keep a better mind. I really like this post. You can definitely implement any of these strategies early. Just try it a few times to see what works and how to make it effective in your home.